Forty-one-year-old Kochukutty Amma is forced to live inside a school building with her family at Valiyathura village near Thiruvananthapuram. She was shifted here from Shankumugham beach five years back in 2013, when raging sea waves claimed the land where her hut was situated. Kochukutty’s family is not the only one shifted to this building, which belongs to the fishery department of the Kerala government. There are 10 more families in this building braving tough and unhealthy conditions. The government has promised to provide homes to these families, but the construction of the houses isn’t complete yet. This is the stark reality of Kerala today. A state situated on the southwest coast of India that consistently appears in the annual list of the must-see tourist destinations of Lonely Planet in Asia. This province blessed with beaches, backwaters and verdant forests also wears the tag of being God’s Own Country. But now Kerala is losing its glory. Almost half of the state’s coastline is endangered today and a large-scale displacement is inevitable. Mercy Kutty Amma, Kerala’s Minister for Fisheries and Harbour Engineering, admits that her government faces a “big challenge” of relocating more than 30,000 families who live close to the coastline. “Every year, so many houses are lost by coastal erosion. We have to relocate the people living there elsewhere,” she told indiaclimatedialogue.net. Kerala has a population of about 33 million, out of which 80% live in the state’s nine coastal districts. The 600-km shoreline is densely populated and the pressure of habitation on the beaches has increased manifold in past three decades. Besides increasing tourism, business and industrial activity have played a major role. 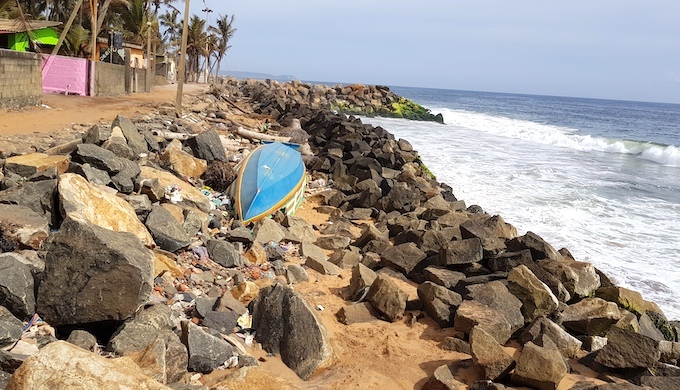 Despite the Coastal Regulation Zone (CRZ) guidelines issued by the government and Coastal Zone Management Authorities (CZMA) appointed in various states and union territories, the coastline of India is in a poor state. Flouting of rules is rampant. Coastal regulation guidelines are diluted by the government itself to facilitate ill-planned development projects. The total length of India’s coastline is more than 7,500 km. Around 250 to 300 million people live along this, and a majority is dependent on the coast and sea for their livelihoods. A report released this year by National Centre for Coastal Research (NCCR), a department of the Ministry of Earth Sciences, says almost one third of India’s coastline is eroded in the past 26 years. The study, done between 1990 and 2016, however, also speaks about the new landmass formation (accretion), which is almost as much as erosion. Nevertheless, erosion remains a concern for several state governments and the people living along and near the shoreline. West Bengal, Kerala, Puducherry and Tamil Nadu are among the top states where erosion is more than 40%. States like Odisha and Andhra Pradesh have seen more than 40% accretion, which means formation of land due to deposit of sediments. West Bengal has lost more than 99 sq. km of land due to the net effect of erosion and accretion. While releasing the report in August, M.V. Ramana Murthy, Director, NCCR, termed the coastal erosion an “alarming threat” for the population living along and near the coast. He stressed the need for immediate steps so that loss of more land and infrastructure to the sea could be avoided. “The damage will be irreversible. Coastal population will bear the maximum brunt, especially villages and recent habitations, including buildings, hotels and resorts which are at risk,” said Murthy. Today, one-third (33%) of the coast is under threat. The NCCR study shows a varying degree of erosion at different places along the seashore. While on the east coast 63% of the West Bengal coast is eroding, on the west coast, besides Kerala, the shoreline seems stable. The west coast, particularly in Kerala and Goa, is densely populated, unlike in the east where most people live away from coastline. However, Goa’s shore is largely stable. Kerala is in a bad shape, as 45% of its coast is eroding. Scientists acknowledge climate change impacts and the phenomenon of sea level rise (SLR), but they don’t believe it has got a direct role to play in coast erosion, at least for now. The sea level rose in last century by 40 cm and this report by the scientists of National Institute of Oceanography, Goa, says that the annual rise in sea level is less than 2 mm per year. Therefore, while the extreme weather events like cyclonic storm Ockhi, which hit Kerala last year, can be attributed to global warming, erosion can be best explained by other factors. “Erosion and accretion are complementary to each other. If the sand and sediments are drifted from one side, it must accumulate somewhere,” says Murthy. In theory this argument is sound, but the construction of structures along the beach has disturbed the equilibrium of erosion and accretion. Sea walls, groynes or breakwaters tamper with the littoral flow of the current close to the shore. As a result, the coast on the northern side of any such structure is eroded due to sea wave effect. Experts and scientists say it’s a combination of factors that affects the shoreline. The NCCR report counts more than a dozen reasons for the shoreline change, categorising them as natural and anthropogenic causes. Natural reasons identified in the report range from action of waves to sea storms to sea level rise. Construction of structures at the coast like harbours, beach mining and building of dams on rivers are the main anthropogenic causes cited. Man-made structures like sea walls, groynes and offshore breakwater exist in about 400 km of the coastline in Kerala. These structures are built for fishing and business harbours, other commercial activities or to protect the land from seawater encroachment. “As we started building the big fishing and business harbours, it has affected the behaviour of sea waves. In the northern part of such structures, you can see the waves hitting the coast with higher intensity as you can see here at Bheemapally,” says Vijayan. Kerala has today more than a dozen big, medium and small ports. The most recent one, which is also one of the biggest ports in India, is coming up at Vizhinjam near Thiravananthapuram. The agreement for this project worth more than INR 75 billion (US 1.03 billion) was signed between the Kerala government and the Adani group in 2015. Though the project isn’t complete yet, local fishermen and environmentalists say that the erosive effect is already being felt on the coast. T, Peter, General Secretary of the National Fish Workers Forum, shows the Shankumugham beach where the erosion is quite visible. Not only were people living near the beach shifted away, the Kerala government had to advise tourists also to stay away from this beach. “The erosion and damage due to sea waves has increased since they have started building the (Vizhinjam) port. You know it affects the northern side of the coast. During rough weather, sea waves hit very hard here and after the monsoon, when the wind blows in opposite direction, the accretion is not possible because the sediment is blocked by these sea walls and groynes constructed all along the coast,” says Peter. Besides being ineffective in coast protection, these man-made structures have also taken a toll on the hills. There are hundreds of quarries in the mountains of Western Ghats today and continuous digging and mining for stones to build sea walls etc. have weakened the fragile hills. This has resulted in an increasing number of landslides. Kerala saw maximum number of landslides this year since the onset of monsoon and the situation turned grave during the recent floods. One of the reasons for the coast erosion is the large number of dams built on almost every river of Kerala. Kerala has today 41 west flowing rivers and these rivers could have been great source of silt, sand and soil transportation towards the coast. This may have helped the accretion. But there are more than 50 dams on these rivers and these dams have blocked the flow of soil to the seashore. The Fifth assessment report of Intergovernmental Panel on Climate Change (IPCC) estimates that 75% of sediment flow is blocked by large dams. “Once we started constructing big dams everywhere, it has blocked the sediment transport and the rich soil coming in along with the nourishment to the sea. It has two effects. One, it has affected the health and the growth of beaches and two, it has also affected the nourishment supply to the sea which helps to produce more marine and fish resources,” says Vijayan. Earlier this year, India’s Ministry of Environment, Forest and Climate Change (MoEFCC) issued a new coastal regulation draft, which should be implemented soon. However, many experts believe that new guidelines have further diluted the existing rules that may aggravate the already endangered coastal areas. “The CRZ notification (guidelines) could have been an important tool to regulate and manage the coast and it would have helped to conserve the ecology and coastal livelihood, but it has largely been either amended to open up the vulnerable part of the coast or the authorities who are overseeing it are spending their time approving the projects,” says Kanchi Kohli, a researcher at New Delhi-based think tank Centre for Policy Research. The Kerala government is now exploring the use of geo-synthetic tube technology to make offshore breakwater at Poonthura. Under the technique large geo-synthetic tubes are placed deep under the seawater to break the energy of waves. The National Institute of Ocean Technology (NIOT) has already experimented with this technique at Kadalur (Chennai) on the east coast. “If successful in Poonthura, this method will be used in Shunkumugham beach area also,” says minister J. Mercy Kutty Amma. However, the effectiveness of this method is still debatable. Is it desirable to fight nature or should one find a way to live harmoniously with it? Many experts and scientist believe that people should move back from the coast to give the sea waves enough space. According to an estimate, INR 10-15 million are spent to construct the sea walls in one kilometre, and mostly it deprives the fishing community from having a natural coast for their livelihood. If people move back from the coast and allow the sea to have its space, there will be better coexistence. The government of Kerala says it has plans to remove people who live within 50 metres from the coast and the process has begun. “We have made arrangements to shift 192 families in flat-like accommodations,” says minister J. Mercy Kutty Amma.